Paralelní Polis is a community space organised around the notions of bitcoin and blockchain technology. 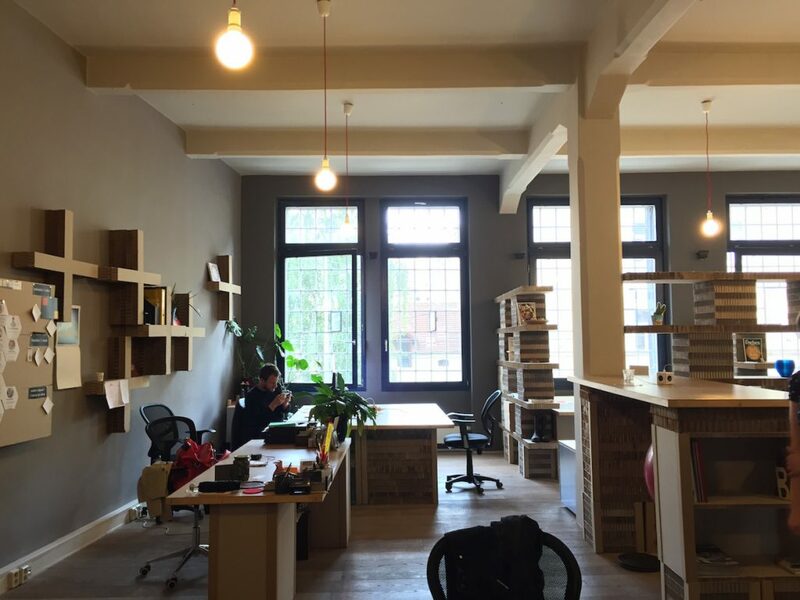 Located in Prague’s upcoming Holesovice neighbourhood, it opened its doors in 2014 to provide a physical space for discussions and activities investigating the relationship between technology and self-organisation. Decidedly “state-free,” the organisation operates with private membership fees and donations, and manages a cafeteria, a co-working space, a 3D printing workshop and an event venue. What is the origin of Paralelní Polis? 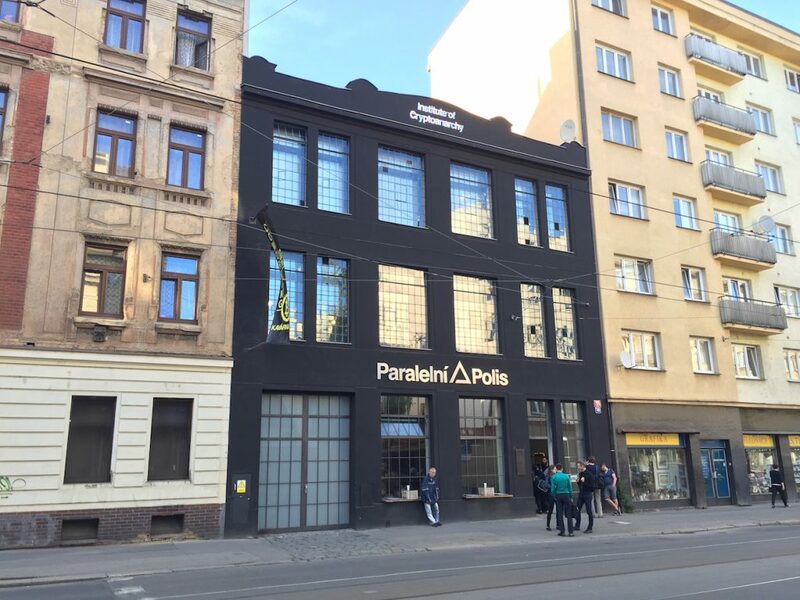 Paralelní Polis is a non-profit organisation that grew out of an idea of the Czech art collective Ztohoven, and since 2012 it has also included hackers from Progressbar in Slovakia, a crypto anarchist collective that worked on strong polemical themes and issues about the state and new technologies. Since the influence of hackers, their ideas and new technologies came into the collective’s spotlight, we decided that we had to create our own hacker space in Prague. We opened our building in 2014. What does the building contain? We wanted to give it a broader concept than just being a hacker space where people can meet and work. The cafeteria at the entrance of the building is to provide first contact with decentralised technologies, represented here by bitcoin. We call it Bitcoin Café: we try to provide our customers with as good a cup of coffee as possible to motivate them to use bitcoin, have their first experience with it, and perhaps gain interest and dive deeper into other parts of Paralelní Polis. Many people think that bitcoin is only for geeks and individuals with technology skills; we want to show them that it is not something difficult at all. We base everything on the ideas of hackers, so this bar is quite unusual because it is inspired by open source ideas. 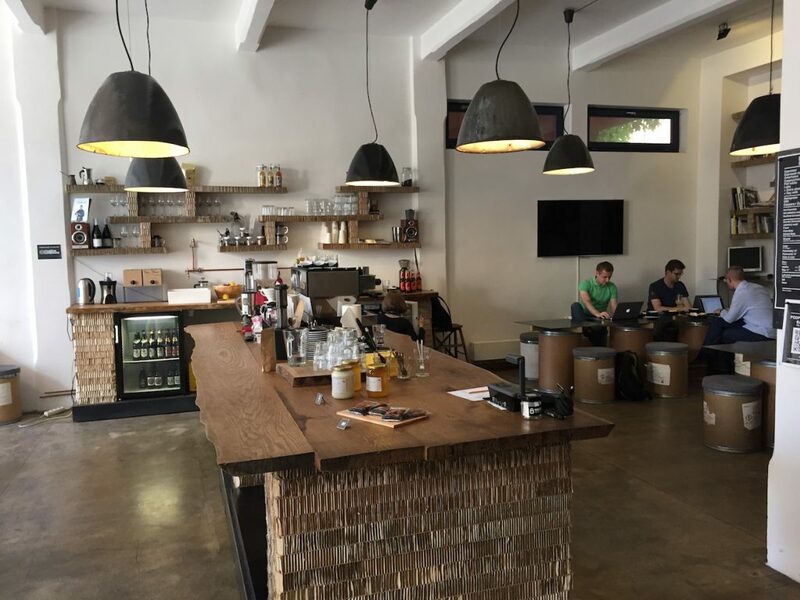 It means that we did not want to bring any barriers between customers and the baristas, everything is open, you can stand next to the barista and see how the procedure works, and how the coffee is made. So, the bar is not a barrier but the centre of the cafeteria. At the same time, the café also works as a kind of filter, so people who are not open minded in this way, usually do not continue to other parts of Paralelní Polis, which makes our lives much more easier. The interior of the whole house is based on paper and honeycomb cardboards that also represent the hackers’ ideas to use various technologies and material in different ways. We are also interested in decentralised production, which is represented in the building with a 3D printing lab that makes us independent from the international network of distributors, and from the ineffective transport of objects from one part of the world to another. We also have a co-working space, which is a place for people who want to work here every day, and a hacker space where our members can work and develop projects. Upstairs, we have the Institute of Cryptoanarchy, also connected to the idea of decentralisation: here we host a critical discussions about the potential and future use of tools like bitcoin and torrent networks that give us anonymity and freedom to do whatever is possible on the Internet. This is the heart of Paralelní Polis, where we organise workshops, lectures, hackathons, screenings, discussions and other educational programs almost every workday. How do you maintain the building? The whole house is state-free, which means that we do not accept any public funding, because the main purpose here is to initiate a polemic discussion about the role of the state in the future. Therefore, we are completely based on private funding, similar to American NGOs: most of our income comes from the membership fees of our approximately one hundred members, as well as through donations from our donor members, people from various backgrounds, philanthropists and professionals who fight for freedom on the Internet, who pay about 15.000 CZK (€560) a month. Most of our donors are very well known, they are opinion makers and trend-setters who help us in spreading the influence of crypto-technology on top levels as well. In a few years, we want to become independent from their funding and establish a special fund with their money to support projects that flourished here, and further develop the ideas and technologies we are talking about. We also have a special heating system: the first in the world based on bitcoin. The chips bitcoin miners – computers that make mathematical operations for the network necessary for bitcoin transactions – heat up very quickly and are usually cooled by air, wasting all the heat. Instead of air, we cool the chips with water and use the heat for the whole building. How does bitcoin impact the management of the house? The whole house is based on bitcoin, which is quite a big obstacle from the economic and business point of view: we have to persuade people to start using it and the currency is quite volatile. But it also makes us exceptional, even internationally: when we opened, the Washington Post and the BBC referred to us as the first bitcoin only café in the world. This crazy concept to make it completely based on bitcoins is very good for PR. Why do you need a building if you are largely dealing with virtual economy? The house is community-focused and it originates from hacker spaces that were physical places where people interested in new technologies and their unusual use and modification could gather. Inspired by this idea, we also wanted to have our own physical space to gather and organise: physical meetings are still irreplaceable as the safest way to communicate. In the long term, we do not think about Paralelní Polis as a building, a physical place, but as a medium: we would like to be more active in public, in medias and social networks. We established an organisation with good programming and content, and now we want to turn the building inside out, and be more influential with the public. We have a lot of connections all around the world, people who support us, who come to our congress every year, and help us promote these ideas and connect with others. Being connected through bitcoin to a global network, what is your relationship with the local economy? There are no obstacles for using bitcoin in the local economy. You can use bitcoin globally for making transactions with whatever part of the world in seconds, but you can do it in the same way here. For example, we organised flea markets to show that bitcoin is also very useful for small transactions, because when you use traditional money, you always have to have change and banknotes and so. Bitcoin is just a mathematical operation, so you can always choose the sum you really want to send. It is very practical in comparison to traditional money. In our neighbourhood, we persuaded the nearby Oko cinema to accept bitcoins, so we exchange people, we send our customers there to spend their bitcoins. And our bitcoin group is very active in convincing more and more places and e-commerce shops to accept bitcoin. We also work closely with the nearby cultural centre La Fabrica (that shares the same building owner with Paralelní Polis) and the art centre Dox that frequently touches our themes. What is the political vision of Paralelní Polis? The value of bitcoin is the principle of the decentralisation: that there is no central authority to set the value of a currency. Decentralisation as a theme is important for us, because we see a big potential for social change in tools like bitcoin. We talk about and brainstorm on concepts that could make services – that are only provided by states today– operate based on totally different principles. Blockchain technology enables many interesting projects like smart contracts that are not written on paper but encoded in the blockchain system. It brings totally new ways of understanding the law and the contract between people, where you do not have to meet physically at some place and agree on a jurisdiction anymore, but can automatise the process or agree on a third party who decides in case of conflict. The name “Paralelní Polis” also comes from a political idea, from Vaclav Benda who was a dissident during the communist era. He used this notion to describe techniques of emancipation from the authoritarian regime and ways to self-organise, to create the Paralelní Polis, a parallel social structure which would exist next to the state structure, without the primary goal of changing it. When Václav Havel commented on it, he said that wherever the private sector is able to organise itself, the state should take a step back, because the people are always better in organising their things than officers. I really like this idea. Community, Economy , civic space, co-working, commerce, community, currency, English, finance, Funding the Cooperative City.